We don't have a lot of options when it comes to pick-up trucks in India except for the likes of the Tata Xenon and the Mahindra Imperio. The only impressive option is the Isuzu D-Max V-Cross. However, in the United States, there is a completely different take on pick-ups. 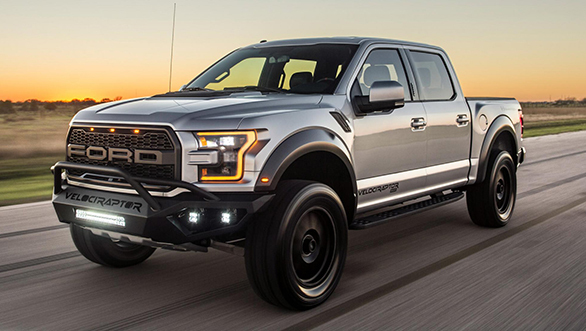 The Ford F-150 Raptor is one the most popular choices in their market. 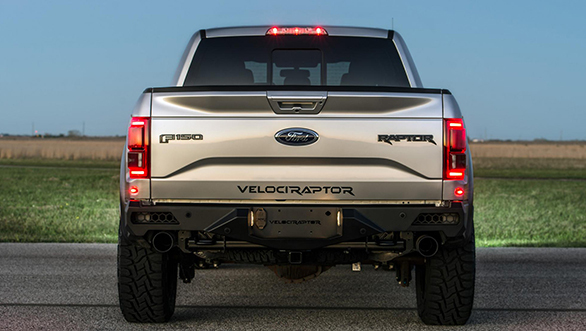 With a power output of 450PS/690Nm, the Raptor is indeed a performance machine. Perhaps, something that American tuning house Hennessey Performance doesn't agree with. Who is Hennessey Performance? These guys are the same team who built the 7-litre, twin-turbo, V8 Venom GT Spyder. The fastest convertible on the planet which clocked a maximum speed of 427kmph. And now John Hennessey and his boys have tricked out the 3.5-litre V6 EcoBoost motor of the Ford F-150 Raptor. The souped-up pick-up truck can be availed in different state of tunes - 500PS, 600PS and an insane 700PS-making version. Hennessey states that the 600PS/840Nm VelociRaptor 600 can do 100kmph in a smidgen over 4.2 seconds. The tuner brand also claims that the now faster pick-up can do a quarter mile in 12.9 seconds at a speed of 178kmph. 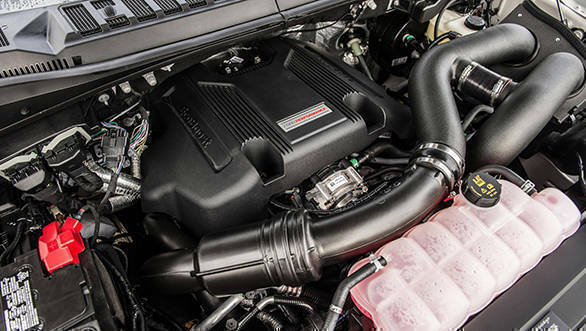 The list of updates that has been added to the stock Raptor include a high-flow air induction system, intercooler piping upgrade and a remapped ECU that can do all the performance wizardry to squeeze out the last drop of rush from that tweaked 3.5L motor. The intercooler for the twin-turbo unit also has been updated. This one can be availed for $22,500 (~Rs 15 lakh). And if you want to get the 700PS-making beast, you have to shell out $49,500 (~Rs 33 lakh) with an even more tricked-out ECU and new stainless steel catback exhaust system that will leave a roaring growl to compensate for a V8. All of that performance is complemented by Hessessey's off-road stage-1 package. It gets LED lights with aggressively styled bumpers. Making it look extremely tempting are the 10-inch Hennessey 10-spoke wheels with 35-inch Toyo off-road tyres. One can also adjust the ride height with the suspension levelling kit. The design package can also be added to the stock F-150 Raptor for $12,950. (~Rs 8.65 lakh). If you still want your Raptor to look more flamboyant, John's team can kit it up with 37-inch tyres, Brembo brakes and revamped suspension set-up. 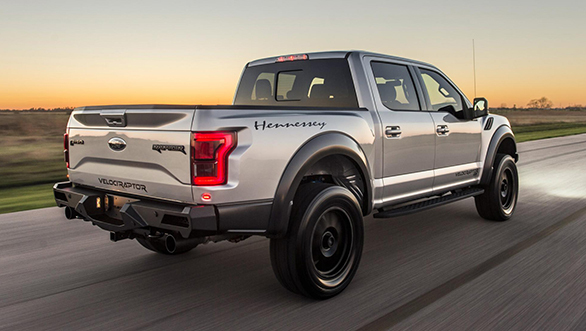 Hennessey Performance will be making 100 units of the VelociRaptor 600. Think this one is crazy? Not when you look at the company's other offerings like the 1000PS ZL1 Camaro, 800 PS Cadillac Escalade and the 800PS Supercharged Mustang.